Sitting on the pebbly beach in Nice, you can watch the huge yellow and blue Corsica Ferries coming and going from the port. For years the Englishman and I said we should go someday. So last summer, after I decided to embark on this crazy adventure, and had arrived in Nice, we finally went. It was a magical trip, and one of the few places we have discovered together, so we promised to go back. This month saw a momentous Birthday, for the gracefully aging Englishman and L’ile de beauté seemed like the ideal place to celebrate. What felt like a minute after we arrived back in Nice from England, we turned right around and set off again this time by sea. Part of the fun of a trip to Corsica, in my opinion, is getting there. Of course there are short flights from the mainland – it only takes an hour by air – but along with cornichon, the Englishman and I have a shared appreciation for nostalgia and things of the past, so we decided to take the five and a half hour ferry ride instead. 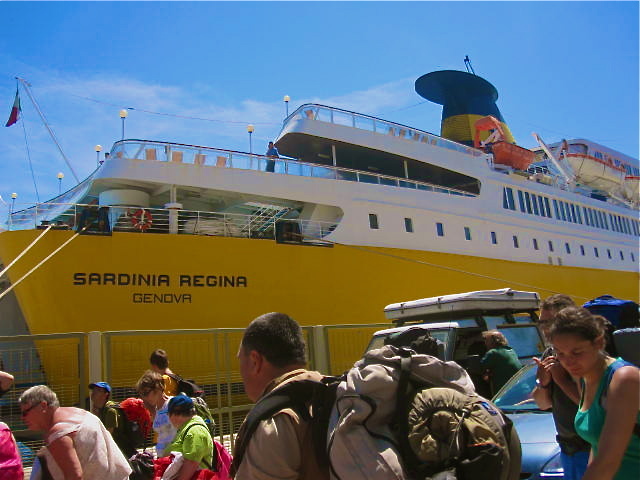 The Corsica and Sardinia ferries are bizarre and wonderful things. The towering ships have distinctly 1970’s interiors and pipe in ceremonial marching music as the vessels depart from and arrive in port. 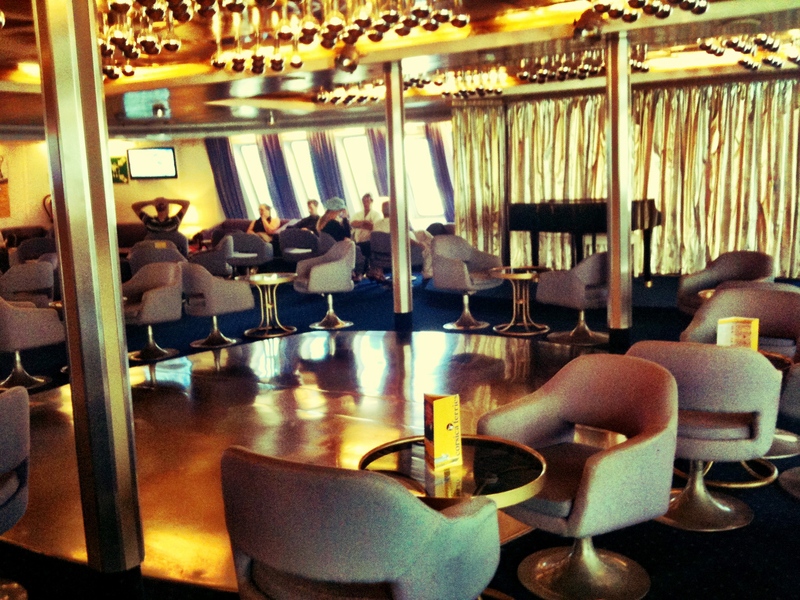 We opted for the early morning departure, and once through the cavernous garage floor and up the elevator to the main decks, the décor did not fail to impress… or at least grab attention. The theme in the “cozy bar” where we took our seats was an overstated, gold and silver lamè motif with hundreds of hanging silver light fixtures, a dance floor, and grand piano. On this particular boat – they seem to have slight differences – there was also a pool (sans water) along side the tiki-bar on the rear deck. The wait-staff onboard seem to be mostly Italian and the uniform is an oddly formal, bright yellow tuxedo jacket complete with bow-tie, which adds a welcome nod to times gone by. The ferry let us off in Calvi, where we got rid of our sea legs over the most delicious moules marinières I have ever had. Huge plump mussels, expertly cooked with white wine and shallots, and of course hot salty fries to compliment the classic dish. From there we made our way to the almost too-adorable-for-words little coastal train that trundles along the north west coast of the island. We opted to stay in the small beach town of Algajola. The biggest selling point of the tiny town is the wide strip of nearly white sand that runs through it, and the blue-green waves of the Ligurain Sea crashing at its shore. Sandwiched midway between two bigger towns: Calvi and L’Ile Rousse, Algajola manages to keep a low profile and the beach only really fills up in the baking heat of August. Our visit happened to coincide with some unseasonably strong, 85 mph, winds ripping through the town. Which made sunbathing an exercise in pain management with the grains of sand like little bullets blown against the skin. 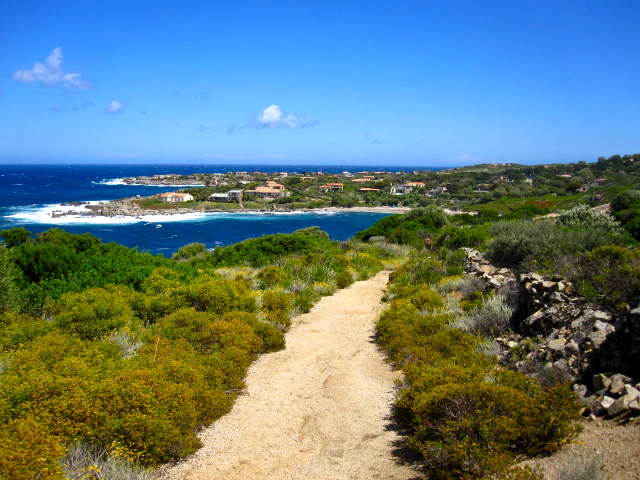 Not to worry though, Corsica is famous for its hiking and walking trails, so we took the wind as a suggestion that we get a bit of exercise in and ventured off on a beach walk. Maude, the stylish woman who runs the fabulous little bed and breakfast where we stayed told us about an easy walking trail to L’Ile Rousse, so we set off to see what we might find. Corsica has a wonderfully rustic and wild feel to it. People describe it as how the South of France was 20 or 30 years ago. The lack of high rises and massive hotels is refreshing, and parts of the island really do still feel pristine and undiscovered. We walked along winding empty trails first on the windy beach and then up rocky hills, and along the old railroad tracks. We never made it into town. Instead, we dropped down from the path to a totally deserted stretch of beach and found a little cover to protect us from the wind. Just off in the distance we saw what looked like a beach bar, I doubted it would be open, as we were the only ones on the beach. 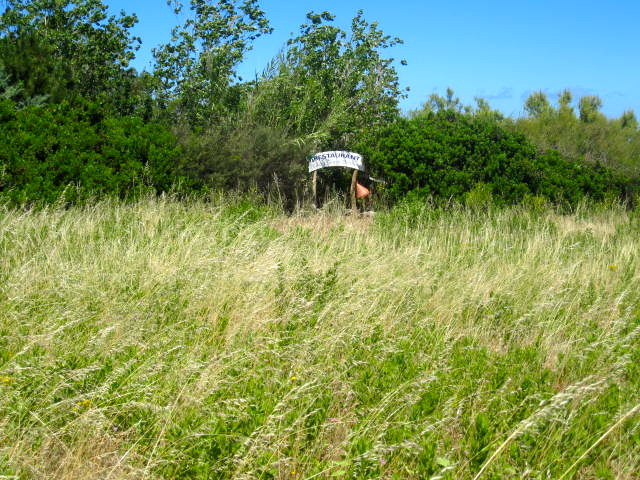 But on closer inspection, we realized we had stumbled upon a full-fledged gourmet restaurant and lively, sprawling, beach bar hidden behind the tall sea grass. Corsica is full of beautiful little surprises like this. Algajola, with a population of just over 300 people, could be overlooked as having nothing more to offer visitors than views of the ancient fortress walls that surround it. In fact, its has a fantastic bakery, a couple of upscale restaurants, two wood oven pizzerias and a top-notch gelateria. Our three-day trip was just about perfect, the winds died down enough for some time on the beach, we kept things simple and had a low-key picnic lunch on the deck of our hotel for the Englishman’s Birthday, and got to spend a little more time on what is fast becoming one of my favorite island destinations. Corsica, I have decided, is a place I could stay for a long time. As we waited for the train, I caught myself daydreaming of a crumbling stone hut in the hillside somewhere just waiting to be renovated. Images of curling grape vines and bright, blooming, Bougainvillea climbing up the walls filled my head as we made our way back to the port where the ferry was waiting to take us on to Nice. Sometimes dreams come true… We’ll have to see if my rustic Corsican abode materializes. And then we proceeded to frantically search our pockets, coats, and every inch of our suitcases repeatedly for about half an hour. We searched our own bags, and then searched each other’s. We tried to call the upstairs neighbor, who has a spare key before realizing the lovely woman doesn’t have a cell phone. And then we started planning how we might break into the second story apartment, or failing that, which hotel we could stay in for the night. And just to set the scene, we put on this ridiculous show for all of the passengers around us, accompanied by the lounge pianist and her rendition of Lionel Richie’s Penny Lover and other such classics. If you find yourself in a similar situation on your travels, try to stay calm long enough to remember the basics. If you are in Kindergarten and you lose something, what do you do? You check the lost and found. And luckily for us, that is exactly where the precious keys had been waiting for us all along. Next we are off for a flying visit of London and then on to the Middle East. Stay tuned. Thanks Katja! Corsica is a beautiful place to visit. I love when the journey can be part of the fun of a trip. Have you read the book Grounded? An amazing story of a couple who circumnavigate the globe without ever getting on a plane!